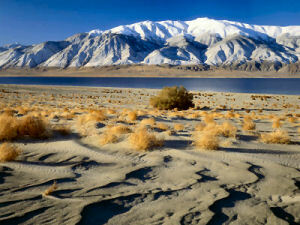 Welcome to Nevada, a land of vast open plains, sheep, cattle, spectacular deserts and magnificent mountains. Gaining statehood in 1864, Nevada has seen its share of booms. In 1859, the discovery of one of the largest silver lodes in the world at the Comstock mine caused Virginia City to appear out of nowhere. Mining for gold, silver, copper, and other minerals and gems still goes on today. But the boom of today is in people, and construction, finance, tourism and gambling are thriving. The gambling and resort areas attract people from all over, families are vacationing in the outstanding resorts, and the excitement of the casinos just keeps on going. This state was named after the mountain range in the west. From out at sea Spanish sailors gazed upon the beautiful mountain ranges of California. They called these mountains Sierra Nevada (snowy range). Sierra Nevada seemed an apt name for the new territory that was being carved out of Utah, but when the deed was done in 1859, the name of this new territory had been shortened to Nevada. This nickname is the official state slogan of Nevada. 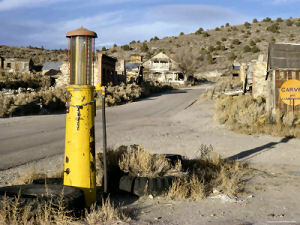 It recalls that Nevada was admitted to the union in 1864, during the Civil War. This slogan also appears on the Nevada State Flag. This is another reference to one of the most important industries in Nevada. or "The Sage State," this nickname is for the wild sagebrush that is so abundant in Nevada. Sagebrush is Nevada's official state flower and is found on the Nevada state flag. The sage hen is a true bird of the west. The sage hen or sage grouse, once very plentiful in Nevada, gives us this nickname. People who live in Nevada or who come from Nevada are called Nevadans. The first commemorative quarter-dollar coin released in 2006 honors Nevada, and is the 36th coin in the United States Mint's 50 State Quarters® Program. Nevada, nicknamed "The Silver State," was admitted into the Union on October 31, 1864, becoming our Nation's 36th state. Nevada's quarter depicts a trio of wild mustangs, the sun rising behind snow-capped mountains, bordered by sagebrush and a banner that reads "The Silver State." The coin also bears the inscriptions "Nevada" and "1864." Nevada became a territory in 1861, several years after a Mormon Battalion in the Mexican War discovered gold and silver in the area of Virginia City. This discovery would later be referred to as one of the greatest mineral discoveries, famously known as the Comstock Lode. Nevada is home to more than 50 percent of the Nation's wild horses. The wild horses dominate the Great Basin in the vast deserts and the more than 150 mountain ranges. The first mention of wild horses was discovered in several journals dating to the 1820s. On behalf of Governor Kenny Guinn and State Treasurer Brian K. Krolicki, the Nevada State Quarter Commission accepted design concepts from the public in the summer of 2004. The 18-member Commission reviewed all submissions, and forwarded five recommendations to the United States Mint. The corresponding design images were created by United States Mint sculptor-engravers and artists in the United States Mint's Artistic Infusion Program. 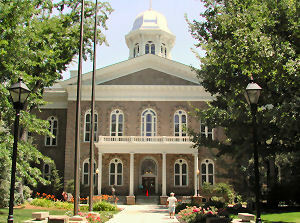 The citizens of Nevada voted on the designs. More than 60,000 votes were cast, and the people of Nevada favored the galloping horses design, "The Silver State." On July 20, 2005, the Department of the Treasury approved the design of three galloping wild horses, sagebrush, the sun rising behind snow-capped mountains and the State's nickname, "The Silver State," inside a banner. The four other design concepts considered during the state-wide vote were " Nevada's Early Heritage," featuring a petroglyph and native artifacts; "Silver Miner," with a miner holding a pick axe in front of a Comstock mine; "Nevada Wilderness," featuring an image of a Big Horn Sheep above snow-capped mountains; and "Battle Born Nevada," featuring a pair of crossed pick axes fronted by a stylized star, representing Nevada's entry into the Union. Nevada (From Sea to Shining Sea) , by Suzanne Williams. 80 pages. Publisher: Scholastic Library Publishing (February 2003) Reading level: Grades 3-5. Presents information about Nevada's people, geography, history, landmarks, natural resources, government, state capitol, towns and cities, and more. Nevada (World Almanac Library of the States) , by Jon Hana. 48 pages. Gareth Stevens Publishing (February 2003) Reading level: Grades 4-6. Filled with the most up-to-date information, including the latest Census results. Full-color photos bring to life the story of Nevada. In addition to an in-depth factual profile of Nevada in the form of a state Almanac, this book offers fascinating and lively discussions of the state's history, people, geography, government, economy, culture, and lifestyles. A section on Notable People, a calendar of events, and enough primary source documents, time lines, maps, and other tools to make this unquestionably the best young adult reference material on the USA available anywhere. Nevada: A History , by Robert Laxalt. 176 pages. Publisher: University of Nevada Press (November 1, 1991) An evocative portrait of the state that "didn't deserve to be" but became one anyway. First published in 1977, this edition includes a new preface that reexamines Laxalt's predictions for Nevada made almost 20 years ago and reflects on the changes that have occurred in the state: the urban plight of Las Vegas and Reno, the renewed appreciation of the land by conservationists and opportunists, and the explosive growth of tourism and gaming. The Silver State: Nevada's Heritage Reinterpreted , by James W. Hulse. 392 pages. Publisher: University of Nevada Press; 3 edition (July 9, 2004) Renowned historian James W. Hulse recounts the major events--historical, political, and social--that have shaped our state. Hulse's cohesive approach offers students and general readers an accessible account of Nevada's colorful history. The new edition highlights the social and political changes that have occurred since the original publication of The Silver State in 1991. Hulse discusses the impact of a growing population; changes in the economy and education system; expanding roles of women; recent developments in state politics, including the 2003 legislative session; the influence of Nevada's growing ethnic population and increasingly divergent demographic groups; and the impact of federal policies, including President George W. Bush's 2002 decision to authorize the opening of a nuclear-waste depository at Yucca Mountain. In addition, all the recommended reading lists have been updated. Uncovering Nevada's Past , edited by John B. Reid, Ronald M. James. 288 pages. Publisher: University of Nevada Press (April 1, 2004) Nevada's relatively brief history has been nonetheless remarkably eventful. From the activities of the first Euro-American explorers to the booms and busts of the mining industry, from the struggles and artistry of the Native Americans to the establishment of liberal divorce laws and such unique industries as legalized gambling and prostitution, from Cold War atomic tests to the civil rights movement, from the arrival of a diverse and rapidly growing urban population to the Sagebrush Rebellion, Nevada has played a part in the nation's development while following its own ruggedly independent path. In Uncovering Nevada's Past, historians John B. Reid and Ronald M. James have collected more than fifty major documents and visual images--some never before published--that define Nevada's colorful and complex development. Roadside History of Nevada , by Richard Mareno. 286 pages. Mountain Press Publishing Company (July 1, 2000) There's more to Nevada than one-armed bandits, cheap buffets, and Elvis impersonators. From ice ages to expeditions, Paiutes to pioneers, and dams to divorce seekers, Roadside History of Nevada provides an overview of the Silver State. Richard Moreno divides Nevada into six geographical-historical areas, rich and often surprising in detail: Pyramid Lake yielded a world-record 41-pound cutthroat trout; Virginia City housed Mark Twain when he wrote for the Territorial Enterprise; and Lovelock Cave was the site of one of the West's greatest archeological misunderstandings. Survey the boom and bust of the mining industry, trace the desperate plight of the Donner party trapped in Sierra snow, and observe the growth of gambling from low-profile to a neon-castle industry.